Many Chinese around the world love hotpots, but few go as crazy about cooking in bubbling pots of broth as Singaporeans. 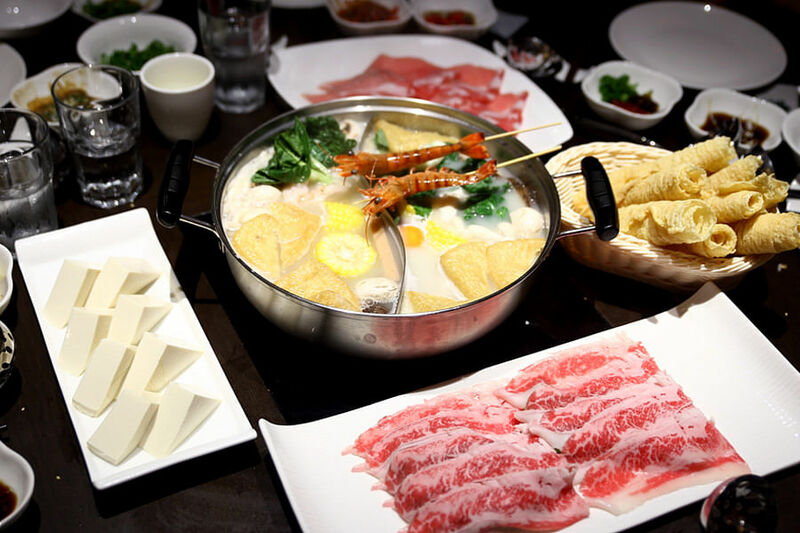 We can have hotpot, or steamboat as we prefer to call them, at most times of the day - for lunch, dinner and supper. And many do not think twice about sweating over the pots outdoors next to busy roads in sweltering tropical heat. I remember a trip to Hong Kong where I asked my hotel concierge to recommend a hotpot restaurant for lunch and her response was that I must have been mad. With slightly raised eyebrows, she replied: "Hotpot restaurants open only for dinner." Well, in Singapore, they open day and night. And here are my five favourite steamboat places. The steamboat here is the restaurant's best-kept secret. It is also the best I've eaten. It's not cheap though, at $180 a person, for a minimum of four persons and up to six persons. But before you complain about the price, take a look at the list of food items and you will find that it is not that bad after all. There is live lobster, star garoupa and tiger prawn, crab claw, abalone, spiky sea cucumber, bird's nest, USDA Prime ribeye and kurobuta pork, among others. 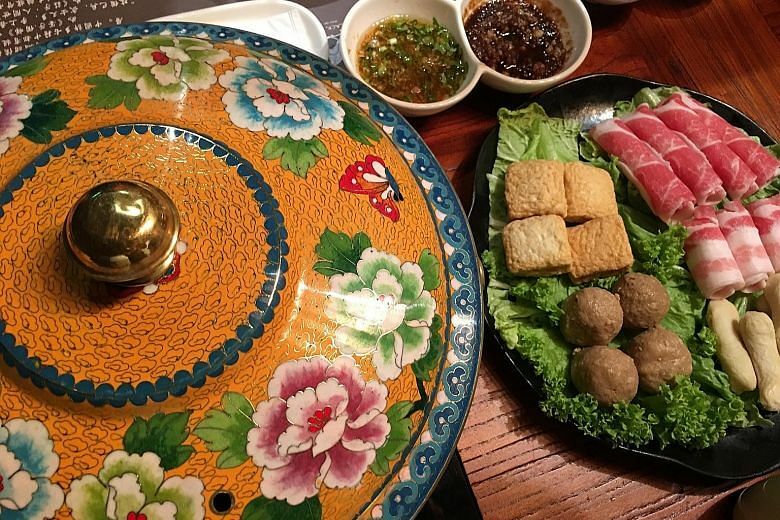 My favourites are the handmade balls - made with Angus beef, kurobuta pork and dace fish - as well as plump shrimp dumplings of a standard that only a top Cantonese restaurant like Man Fu Yuan can boast of. The steamboat is not on any of the restaurant's regular menus. But those in the know - that includes you now - call up three days in advance and turn up prepared for a feast. A server is assigned to do the cooking for you because, with such precious ingredients, you do not want to run the risk of overcooking anything. The meal starts with an empty pot and the server prepares the broth with chicken infused in rice wine and aged hua diao. Then, one by one, the ingredients are cooked for you at the table. For a finale, rice is added to the remaining broth to make a delicious porridge. And you end up with an empty pot, which is how you start the meal. Go hungry, because there's lots to eat. The restaurant moved a few doors from its old location in Ion Orchard in December, but the menu stays pretty much the same. It has another outlet at Great World City. 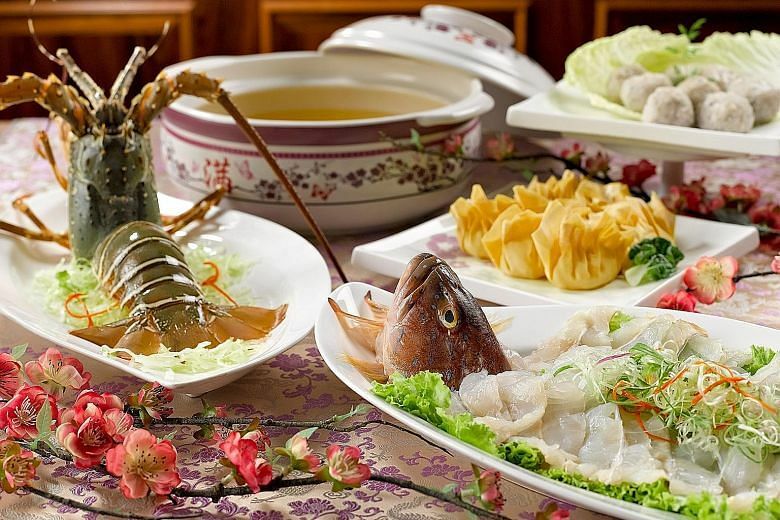 What is impressive here are the Cantonese broths, which include Healthy Chicken Soup, Traditional Pork Bone Soup and Century Egg & Parsley Soup. But the Szechuan Spicy Soup is designed for chilli cowards and too mild for me. You get good quality live seafood such as prawns, clams and garoupa, but these will bump up your bill considerably. But the house-made meatballs, fishballs and yong tau foo items are very good too, and these are not expensive. 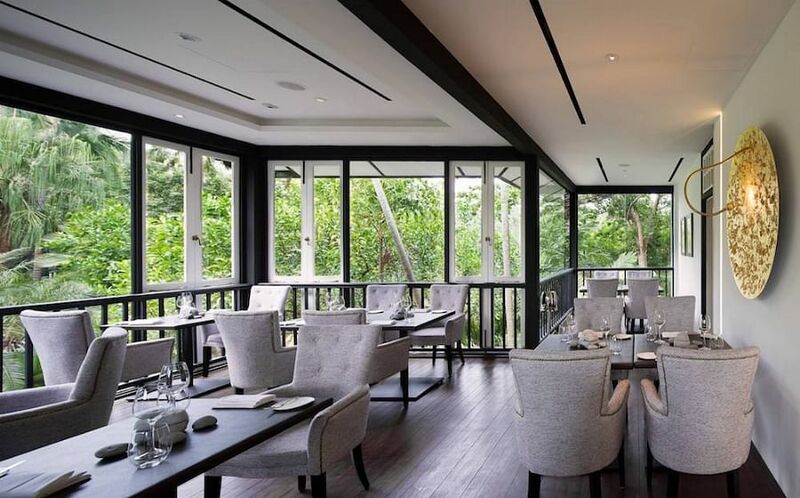 A good idea is to order a set menu, which ranges from $118 for two persons to $278 for four persons and include a selection of seafood, meat and vegetables. If you can't find your favourite ingredient in the list, just top it up with an extra a la carte order. 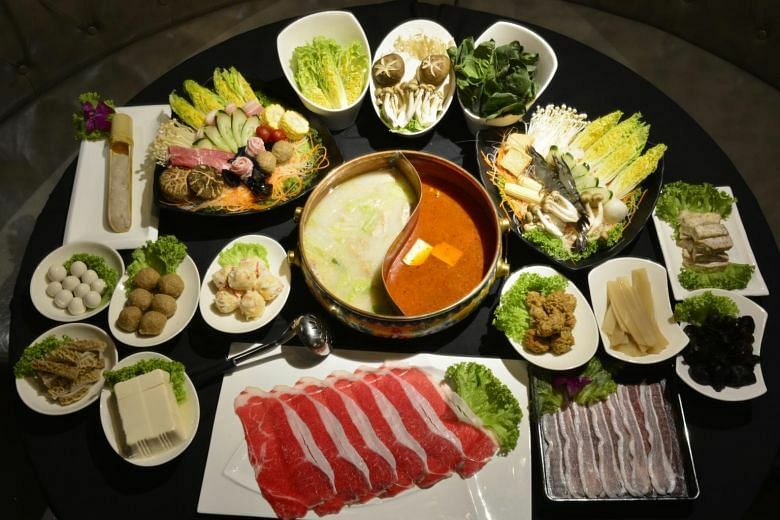 This hotpot chain by the Paradise Group opened its biggest outlet in VivoCity in December, adding to its earlier two restaurants in Kinex and Centrepoint malls. A fourth one will open at The Star Vista. The chain recently took its best-selling original Beauty Collagen Broth off the menu because of inconsistent supplies of shark's cartilage, a crucial ingredient in the recipe. It has been replaced by a new Beauty Collagen Broth that is brewed with dried scallops. It is delicious at the start, but the delicate seafood taste gets overpowered after you add other ingredients to the pot. I also miss the creaminess of the original collagen broth. But the owners say they are working on improving it. Other than that, the hotpot here is great. 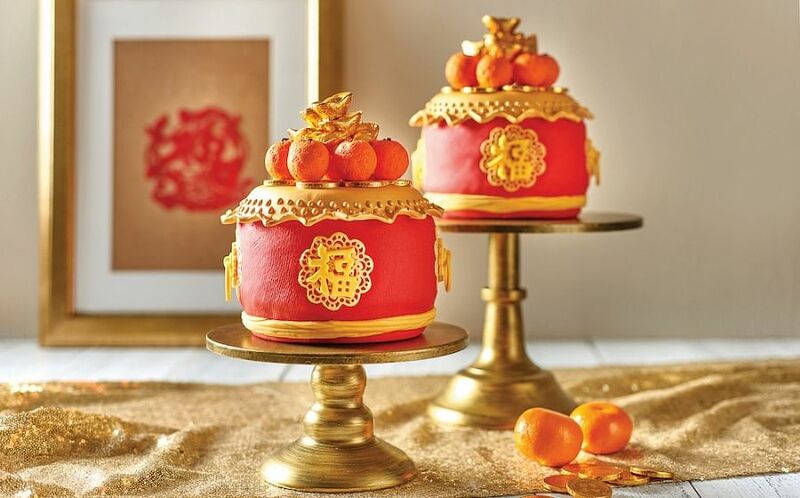 Check out the handmade balls and pastes, which taste fresh and have a springy texture. Meat and seafood quality is good too. My must-have item is the fried beancurd skin, which is the best you can find among hotpot restaurants here. You dip the rolled-up, crispy beancurd into the broth for just three seconds. That way, it soaks up the flavour of the broth while still staying a little crisp. You can eat here for less than $50 a person, but be prepared to pay more if you order live seafood or premium beef. This branch of a Taiwanese hotpot chain has stayed a bit under the radar since opening in mid-2017. That is a pity because the quality of its broths, meats and seafood is very good. The only setback is the price, as the bill can easily reach $100 a person. But if you do not mind paying for good food, you will be happy. My favourite Fish Maw Chicken Pot broth, for example, costs $48, but it comes packed with fish maw and kampung chicken, so you can have a meal with just the broth. What is weak here are the balls, which do not appear freshly made. The fried bean curd roll is not the best either. 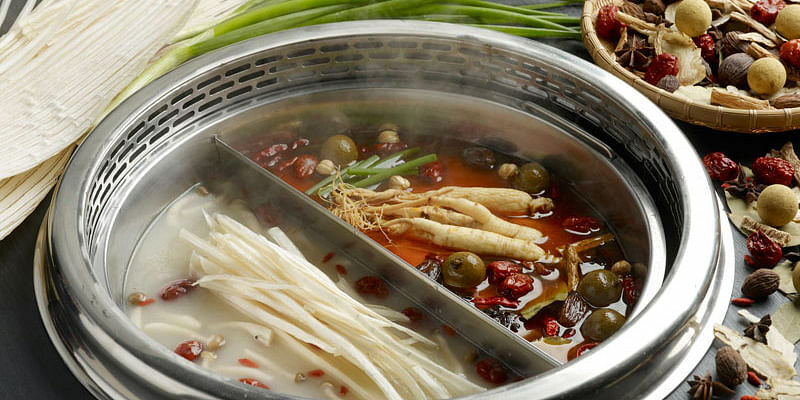 Get those right and this may be the hotpot restaurant to beat in Singapore. 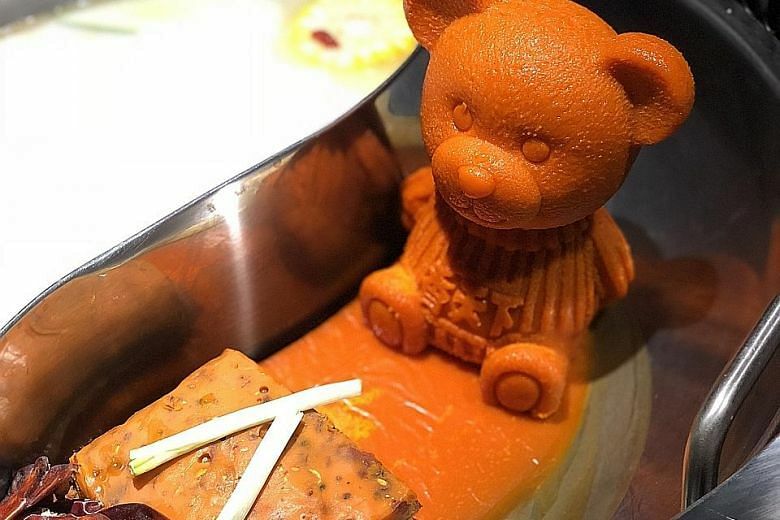 Better known for its teddy bear that melts into a spicy broth and Barbie dolls draped in slices of raw wagyu beef, this hotpot restaurant from China also offers very decent ingredients. The chain says it does not serve frozen meat or seafood and the quality certainly lives up to the claim. In fact, the tiger prawns look like they are freshly fished out of the tank. And the wagyu beef is delicious. I love the Prime Minister's Pork Balls, named for being a favourite with former British prime minister David Cameron. I can understand why he was so taken with them, because the handmade balls taste fresh and flavourful. Some of the cooked dishes, such as Deep Fried Pork Slices, are good too. Expect to pay from $60 a person. This story was first published on The Straits Times.